You can also pay an outsourced company to register your company automatically every year for around 100$. Currently we use.. 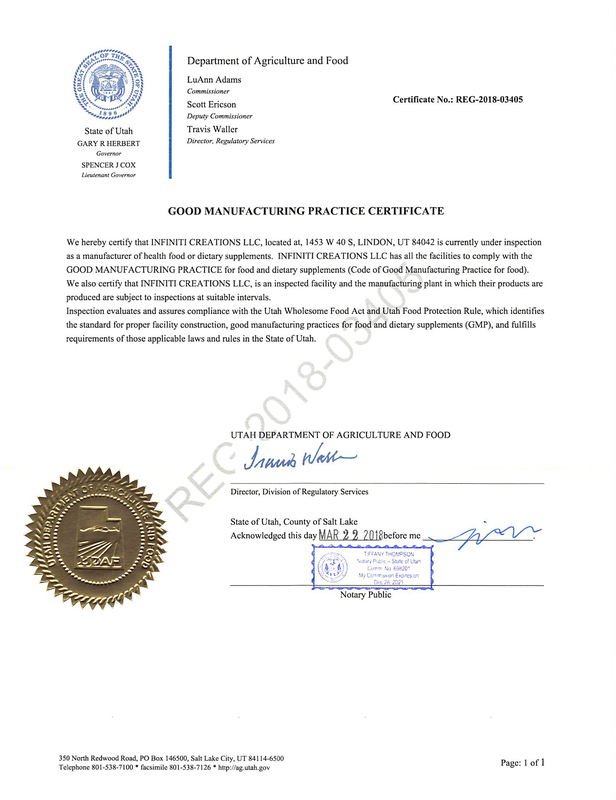 The advantage to an outsourced agent registering you with the FDA is #1 you never need to remember to renew your registration and #2 you get a fancy certificate you can freely display in your office, or on your website. We suggest you perform your due diligence as the seller of this product and ensure and conform to all FDA guidelines and regulations. Should you have any additional questions regarding this please don't hesitate to ask your account manager. In regards to FTC regulations and guidelines, you are ultimately responsible for all claims, its marketing, its benefits, its side effects, etc. If you list any claims they should be substantiated by a 3rd party reputable clinical study. Listing claims on the label just because "other companies are doing it" cannot be your reason for listing it on the label. Infiniti is NOT responsible for substantiating any claims you make on your label. Drug claims that would indicate the product can "diagnose, cure, prevent, treat" diseases cannot be used on any supplements and will not be added even if requested. If you have an existing label that includes a drug claim we may exercise the right to remove it even without notification.